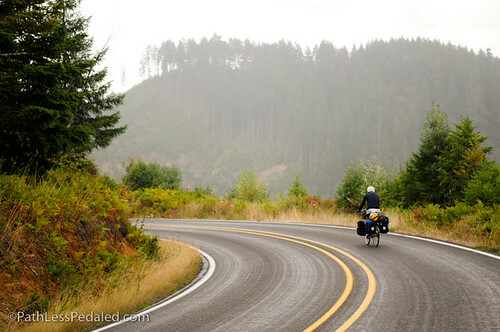 Home > Route > Days 49-54: Eugene, OR to Harris Beach S.P. Smith River Road eventually dumped us onto the 101 and we turned south, through Reedsport, to Winchester Bay. 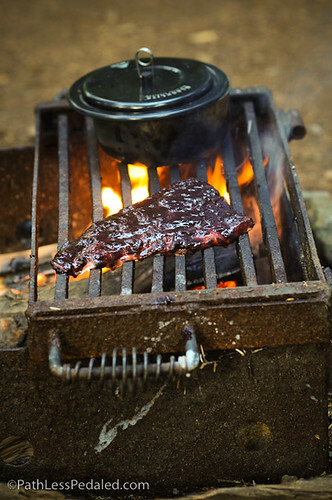 We picked up some freshly-caught salmon and marionberry bbq sauce and feasted at our campsite at Umpqua Lighthouse S.P. 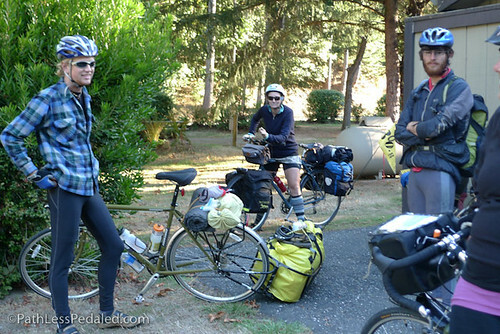 We also met a German couple that were four months into a bike tour from Alaska to Argentina (cool!). Day 51, we roll out early and head south down Hwy 101. We’re picking up where we left off at the end of our coast tour two years ago, only now we’re much stronger riders. In North Bend, we opt to walk across the nearly 1-mile-long bridge, and then we stop for a long break at a coffee shop. 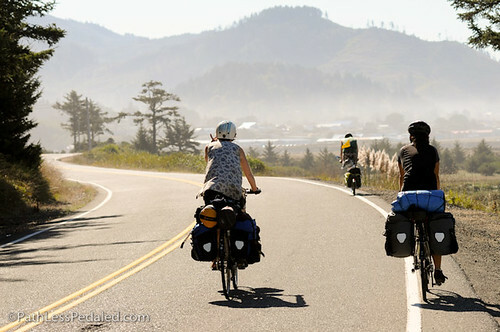 Eventually, we roll out, following the Oregon Coast Bicycle Route through Coos Bay and Charleston, then turning off to Sunset Bay State Park. We’re delighted that the hiker/biker area is lush and green, and we’re greeted by two young deer that are totally unafraid and just roam around the campsite eating leaves. 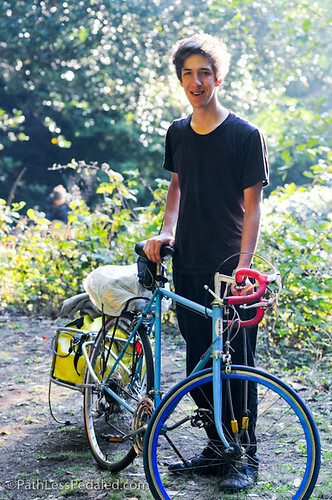 Over the course of the afternoon, nine other bike tourists arrive and set up camp as well – and we land in the middle of a sort of travelling circus. 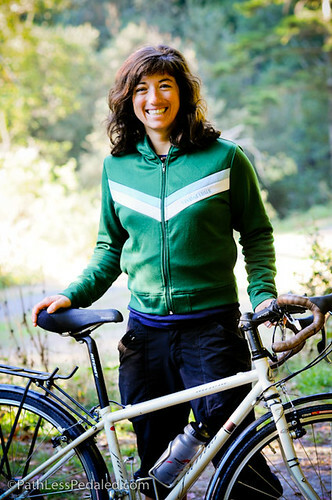 We stay up talking with folks and hearing about everyone else’s routes and destinations – and it begins to appear that, because of the lateness of the season, most cyclists on the coast right now are on some sort of epic, long-distance ride. Early in the morning of Day 52, we wake up to the sound of rain on the tent. 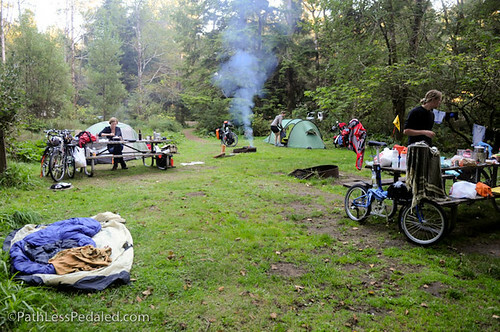 We scramble to pull our laundry off the clothesline and then crawl back into bed for a few more hours, as those tourists who were sleeping out in the open hurry to put up tents or find a sheltered spot. Eventually, we drag ourselves out of the tent, pack up our stuff in the rain and find a semi-dry spot to make coffee and eat breakfast. Our route takes us along a road called Seven Devils, so named for the seven hills you have to climb over. In the drizzling rain, we feel like we’re riding in the clouds, even as we’re wet and chilled. We roll in to Bullards Beach State Park around 12noon and decide to throw in the towel and set up camp, tired of slogging through the rain. As luck would have it, a yurt has opened up and we’re treated to a mattress, heat and electricity for the night! We take the opportunity to dry out all of our stuff and watch some ‘Dexter’ on the laptop. Day 53 starts off with coffee in Bandon, just two miles down the road from the campground. 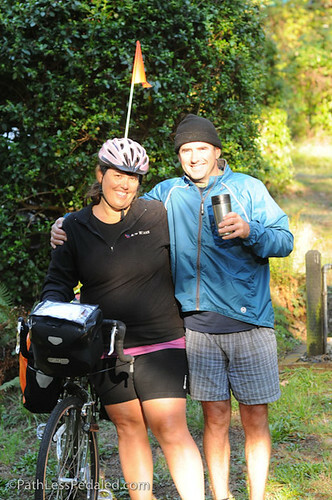 We briefly meet another couple in the middle of a cycle tour down the coast to San Diego – and who we will meet again at the top of a hill down the road – and again at the campground at Humbug Mountain. 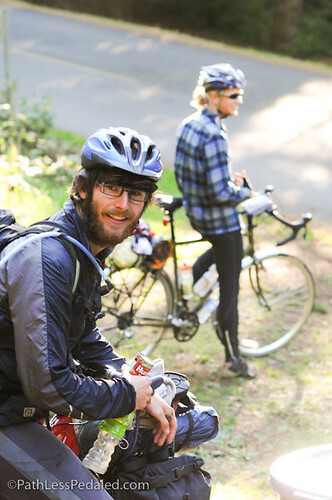 The ride to Humbug Mountain is fast, with a tailwind, and incredibly scenic. The campground is just a short walk from the beach, where I happily chase after seagulls and cartwheel on the sand. 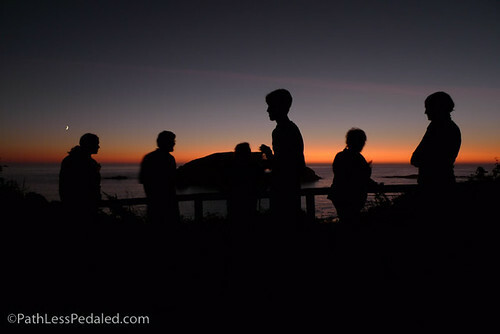 That night, there are six other cycle tourists at the campgroud, the two that we met earlier in the day, two that we met at Sunset Bay and two that we meet just now. Day 54 promises to be a long day, so we are up early. Our attempt to make pancakes fails miserably, as our pan buckles from the heat of the stove and causes everything to stick. All day, we will ponder how to make better pancakes the next morning. Over the course of the day, we will leap-frog with all the cycle tourists that we camped with the night before, passing each other again and again. It’s nice to ride with some other people for awhile. In Gold Beach, we stumble into a coffee shop that also has cheeseburgers, so we stop for an early lunch. From Gold Beach, we roll up and over at least a dozen rolling hills. It’s unseasonably hot, approx 85-90 degrees, and we eventually run out of water, as there are (surprisingly) no services for 20 miles south of Gold Beach. About 6 miles before our destination campground, we happen upon an RV resort with a store stocked with cold water, juice and root beer! We sit in the shade and enjoy our cold drinks. And then we spin the last few miles into Harris Beach State Park, another gorgeous site, full of space for hikers/bikers, meet up with some of the same folks we’ve been camping with the past few nights, and watch the sunset over the ocean. What an awesome ride ~ if you ever make it to Reno, Nevada contact me, love to host and meet you. Ride the backroads of Nevada! Thank you for your fantastic accounts of your travels! Its great to hear some of the details of your adventure. If you plan to take the ACA route east out of San Francisco and need anything in Sacramento let us know if we can help. 🙂 Happy pedaling. I was really glad to see you re-did the Smith River and saw the beauty I saw and had the pleasure of taking the path less pedaled. Susan and I have just finished the 350 mile trip from Washington DC to Pittsburgh on the C&O Canal and Greater Allegheny Passage trails. Captain Susan is now a confirmed dirt road rider provided it is flat. Today is my 58th birthday and still riding!! Go Laura and Russ!!! I was the guy in the cape in portland. 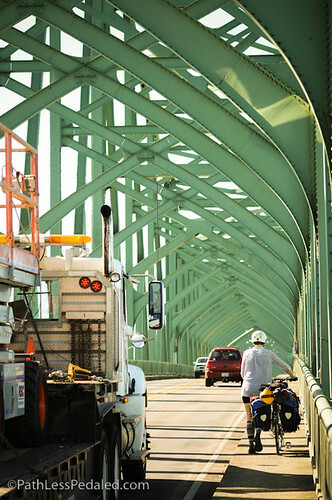 I was born in Coos Bay and I have walked that bridge at least a thousand times. Ironically, I *never* have ridden it, but it seems awfully skinny to ride over.